It’s awards season right now, and with the BAFTAs just gone, and the Oscars around the corner, everyone’s been talking about all things film. While we’ve been busy catching up on the Best Picture nominations, we got around to talking about the best scenes in TV and film featuring a forklift. 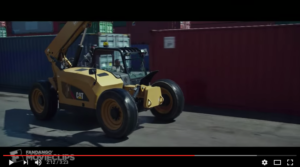 Here are some of the best scenes featuring a forklift from both the big and small screen. The Office, inspired by the British programme of the same name, follows the working lives of people employed by a paper company in a small Pennsylvania city. Arguably the star of the show is Michael Scott, the hapless boss of the company whose long suffering employees struggle to tolerate. In this clip, we see Scott, portrayed by Steve Carrell, insist on carrying out some forklift work. Needless to say, it doesn’t all go to plan. So, we’ve already picked one out from The Office, but considering that one of the main settings of the show is a warehouse, there was always bound to be more than one instance of forklift-based hilarity. Here’s a forklift mishap that will have any warehouse manager watching through their fingers! In his famous documentary, American politician Al Gore uses a lift truck to accentuate a point. Namely, the point that the earth’s CO2 concentration is rising at an unprecedented rate. Whatever you may think of Gore, it certainly helps him to make his point in an arresting manner. This may not strictly be a forklift, but it’ll certainly be relatable to any forklift operator who has had to operate their truck in a tight space. In the clip we see Mike Myers’ Austin Powers hit a dead end when driving a truck down a concrete hallway. He attempts a three point turn, but soon finds himself stuck. Of all the things we’ve seen a forklift used for, this one is new to us. In the clip we see Marvel superhero The Incredible Hulk hurling a forklift truck at Tim Roth’s character, Emil Blonsky. We’d say don’t try this at home, but we’re pretty sure it’s physically impossible. Beloved family film studio Pixar’s 2006 effort Cars has a forklift save the day at a crucial point of the film. When the main character blows a tyre during a key race, it’s the turn of Italian forklift Guido to step up. Despite the jeers of the opposite pit crew, Guido carries out the pitstop in a few seconds. It probably wouldn’t break the world record, but most pitstops aren’t carried out solo. F1 teams should probably look into the availability of this plucky little forklift! While the reality of working in forklifts isn’t as exciting as this clip, we’re okay with that. In this scene we see Hollywood funny man Kevin Hart attempting to save the day not once, but twice, while operating a forklift. We don’t want to spoil it, so watch on for what is probably the most exciting example of forklift heroics committed to film.